Active Attractions provide authentic-looking gaming tables, including roulette, poker, blackjack tables and a money wheel. Whether you’re organising a Las Vegas-themed night, are organising an event for a gaming-themed company or simply want a touch of glitz, glamour and fun, this range of amusements are ideal. 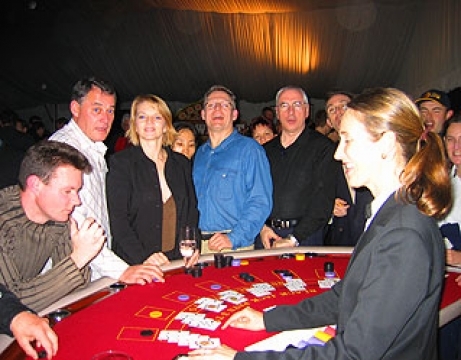 With professionally-trained croupiers who provide peace of mind and expert advice, we can create a package that will suit your needs and enthral your guests. You won’t have any staffing or hiring concerns when you book in Active Attractions – we’ll provide you with friendly, professional and capable floor staff who will ably operate all of our gaming tables throughout your entire event. 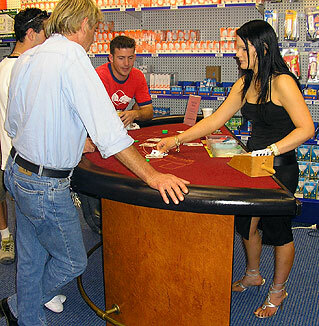 Whenever you hire our casino games in Brisbane or the Gold or Sunshine Coast, you can rest assured that you won’t need a gaming licence to operate them. All of these amusements use fake money (or ‘funny money’) as currency, so your guests won’t run the risk of throwing their savings away on a bad hand or spin of the wheel. Talk to our team if you have any questions about our gaming tables, or if you’d like to organise hire of our high-quality amusements. They’re suitable for all ages, and make an excellent choice for any gathering or event – from corporate occasions to large-scale get-togethers. We’re happy to talk to you about the exact specifications and dimensions of our gaming tables, and it’s no problem for us to discuss the best hire solution for you and your event.